Far from being a mystic or a prophet, Carl Sagan was a man of science, a man of analytical reasoning, with a penchant for wonder and appreciation for the mystery of the cosmos. He’s well-known for his statement that‘we are made of starstuff,’ just beings composed of atomic matter and held together by physics. 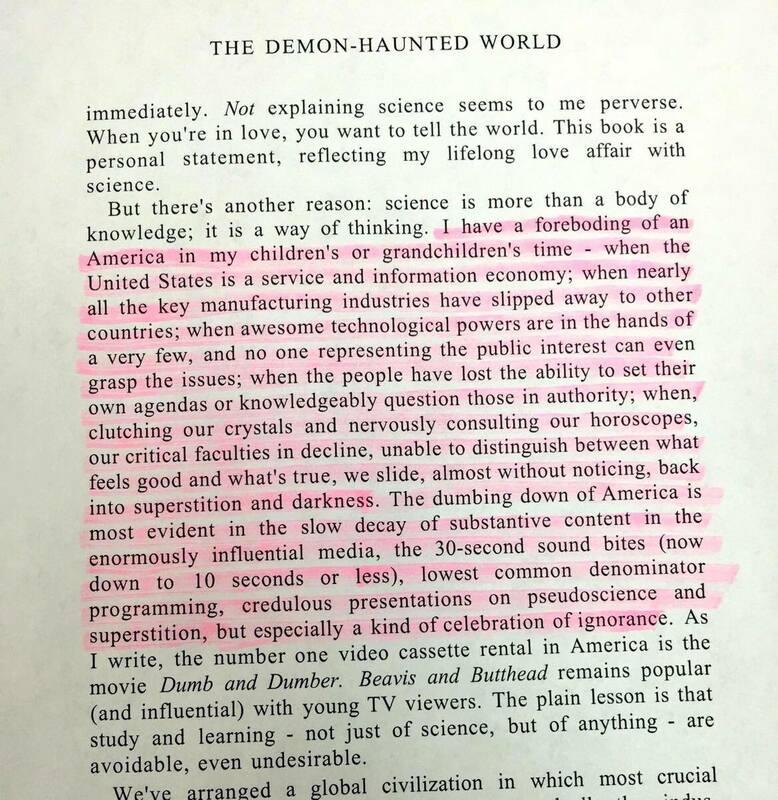 Published in 1995 shortly before Sagan’s death in 1996, The Demon-Haunted World: Science as a Candle in the Dark was Sagan’s attempt to explain the scientific method to laypeople. He took it as his mission in life to alert the world that the intellectual foundation of our society and culture was in jeopardy of being overthrown in a new era of returning superstition, pseudoscience and anti-intellectualism. It was the dumbing down of America that worried Sagan at the end of his life, and in The Demon-Haunted World he offered a rationally prophetic examination of where America was heading. Now, some 20 years later, his words are resonating with those who are paying attention to the changing cultural climate today. He’s right, of course, for this country is now in serious economic dire straits. Manufacturing has been off shored, and millions are indeed dependent on the service economy. Our understanding of the scientific and engineering principles which create the devices and conveniences we depend on are widely misunderstood. At the same time, we are becoming a technocracy, a nation governed by technology which has become so advanced and complex that even our regulatory agencies do not understand what they’re up against. Politically, we are ruled not by elected officials whom we can trust, but by an unelected deep state and super-international organizations which govern by treaty and economic brute force. The result is a sort of abandonment of hope in the system of democracy and a willful ignorance of the issues that genuinely impact our lives. We really don’t know how to redress our grievances, who to blame, or how to intelligently frame the issues facing us today. And so we ignore them. In recent decades, peaking with the hype of the 2012 fantasy, we’ve seen a rise in new age belief systemswhich serves to turn people away from, reality, rationality and common sense, and encourages them to pursue meaningless wild-goose chases in the fields of light working, ascension, and the hype of quantum leaping. This distraction has made it impossible for many to recognize and acknowledge the real threats to our livelihood and survival, causing many to choose hope and faith over education and action. Here, Sagan chides mainstream media for their role in social engineering. The media has the greatest influence on our society, and it is in the ivory towers of media executives where the direction is set for our national intellect. They are the captains of our collective rational and emotional destiny, and Sagan’s comment condemns their fruitful efforts to turn young minds away from reason and towards stupidity. This was 20 years ago, and the effect has since been exacerbated by an order of magnitude. Now we have reality TV and a reality show president. The problems we face today are concrete, albeit subtle and complex. Technology is increasingly enslaving us because we simply do not understand how it works or how to reign in those who control it. We’ve come to depend on its conveniences while simultaneously ignoring its intrusions into our private lives. In the absence of understanding we’ve become complacent and happy with such ignorance, and in this climate, Sagan’s darkly prophetic vision of our future is coming to fruition. This article (Carl Sagan’s Eerily Accurate Prediction About the Demise of America) was originally created and published by Waking Times and is published here under a Creative Commons license with attribution to Buck Rogers and WakingTimes.com. It may be re-posted freely with proper attribution, author bio, and this copyright statement.